Discover Your Nature in Henderson with the 2017 Travel Guide! Whether you're looking for accessible playgrounds, a nice walking trail, or maybe just a new place to grab dinner, our Travel Guide has plenty of pages to explore. Thank you for your interest in Henderson! Thanks for you interest in Henderson, Kentucky! Our nature is to help visitors and guests discover attractions, events, and ways to enjoy the outdoors. Downtown Henderson is a classic river town, rich with history and beautiful historic architecture. 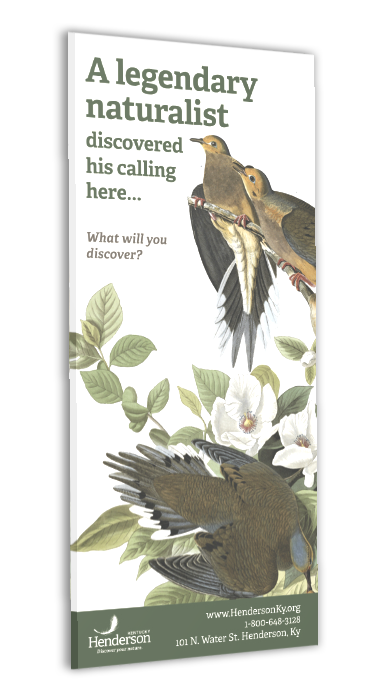 See why John James Audubon State Park was voted the Best Museum in Kentucky by Kentucky Living Magazine readers. Do you know where the new trails are located? Try a hamburger from a hole-in-the-wall restaurant, we can help you find your way! Download our guide for more tips and travel info!